The Biddenham Trail at Biddenham Walking RouteThis trail divides into 3 separate circular routes, loop 1 being the shortest and loop 3 the longest. The trail crosses a variety of terrain and offers the chance to discover some of the history of Biddenham and the possibility of seeing great crested newts and midwife toads in the village pond. 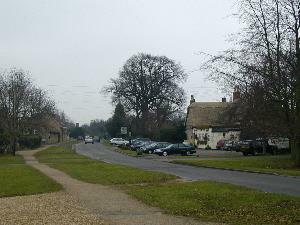 How to get there by car/parking: The village lies just to the west of Bedford and can be reached by road using the A428 Bedford to Northampton road. Parking is available in the Village Hall car park. You may use the Three Tuns car park if you use the pub for refreshments. Otherwise, on-street parking is available. Please park thoughtfully. Notes: Route 1 is the shortest and the least strenuous. Route 2 is longer and part of it has a long stretch of tarmac path suitable for wheelchair access. This trail divides into 3 separate circular routes, loop 1 being the shortest and loop 3 the longest. The trail crosses a variety of terrain and offers the chance to discover some of the history of Biddenham and the possibility of seeing great crested newts and midwife toads in the village pond. Route 3 is the longest.